At the Vanessa Behan Crisis Nursery, we believe every child deserves to have clean diapers. That is why we distributed over 250,000 diapers in 2018 to families in need. 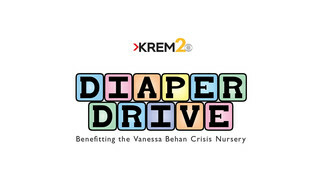 The KREM 2 Diaper Drive is the Nursery's only large-scale diaper drive, and it has collected over one million diapers over the years for Spokane area families. This year the demand is high, and we hope to be able to provide more diapers than ever before. We are asking for volunteers to help make this possible. Volunteers work a 2.5 shift at one of the participating Rosauers stores, where they pass out flyers to shoppers and encourage them to purchase a week's worth of diapers for a family in need. The event is a lot of fun, and you can bring a friend or two to join you! 14th Avenue: 907 W. 14th Ave.
29th Avenue: 2610 E. 29th Ave.
Browne's Addition: 1808 W. 3rd Ave.
Spokane Valley: 10618 E. Sprague Ave. Please note: If you are signing up as a shift leader for the first time, there will be an in person training on Monday, May 6th at noon and again at 4:30PM here at Vanessa Behan Crisis Nursery. Thank you!